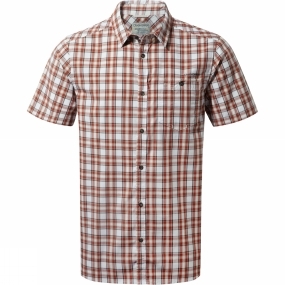 The Men's Elmwood Short-Sleeved Check Shirt from Craghoppers is a casual shirt that would be ideal for warm weather adventures. It boasts lightweight fabric that utilises SolarShield Zinc Oxide technology to provide UPF 30+ keeping your skin safe from harmful rays while the sunglasses loop and wipe is there for your convenience. A patch pocket and a more discreet, zipped security pocket is there when you feel like you should utilise a degree of caution.